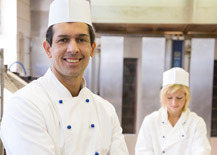 Westfield Caterers began in 1996 and has been a leader in food and service ever since. We have served small residential gatherings while providing incredible experiences for weddings, bar mitzvahs, confirmations, birthdays, anniversaries and large corporate events. Since opening in 1996, we have maintained a professional and innovative balance. Everyone on our staff is a team player and believes that attention to detail is what counts. We all work with the goal of providing extraordinary service for all. We have become one of the most requested cateriers in the area. We make sure we live up to that at every event -- especially yours!